The biggest new feature in cubes is the “pluggable” model. You are no longer limited to one one model, one type of data store (database) and one set of cubes. 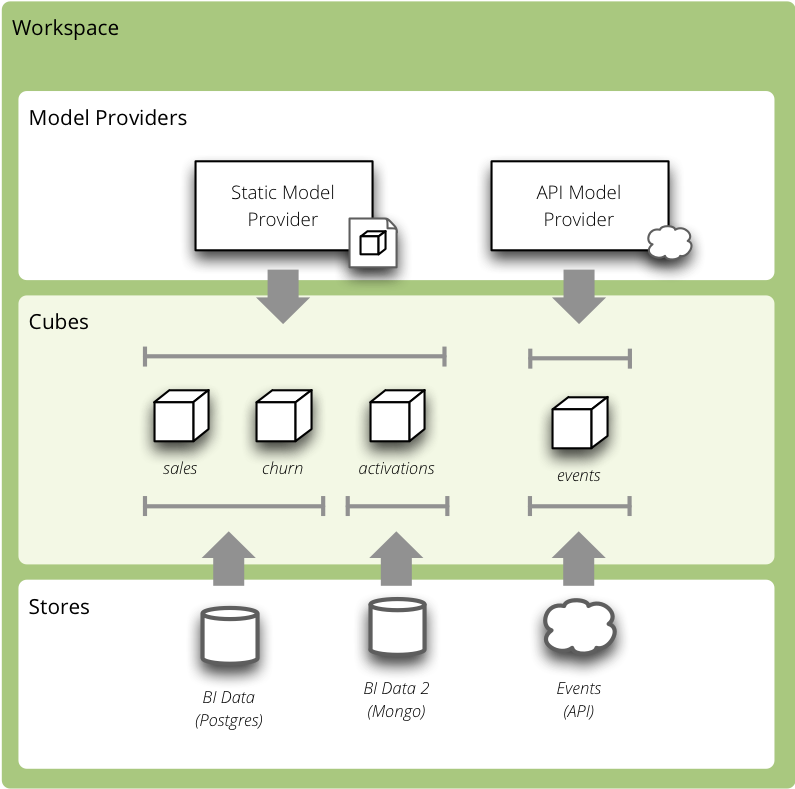 The new Workspace is now framework-level controller object that manages models (model sources), cubes and datastores. To the future more features will be added to the workspace. For more information see the Workspace documentation. Rewritten Slicer server in Flask as a reusable Blueprint. support for outer joins in the SQL backend. Cubes 1.0 supports Python >= 2.7 for Python 2 series and Python >= 3.4.1 for Python 3 series. The old backend architecture was limiting. It allowed only one store to be used, the model had to be known before the server started, it was not possible to get the model from a remote source. For more details about the new workspace see the Analytical Workspace documentation. The slicer.ini configuration has changed to reflect new features. The section [workspace] now contains global configuration of a cubes workspace session. The database connection has moved into [store] (or similar, if there are more). The database connection is specified either in the [store] section or in a separate stores.ini file where one section is one store, section name is store name (as referenced from cube models). If there is only one model, it can be specified either in the [workspace] section as model. Multiple models are specified in the [models] section. Slicer server is now a Flask application and a reusable Blueprint. It is possible to include the Slicer in your application at an end-point of your choice. For more information, see the recipe. added simple authentication methods: HTTP Basic (behind a proxy) and parameter-based identity. Both are permissive and serve just for passing an identity to the authorizer. /model – without replacement doe to the new concepts of workspace. Alternative is to get list of basic cube info using /cubes. cuts for date dimension accepts named relative time references such as cut=date:90daysago-today. See the server documentation for more information. Many actions now accept format= parameter, which can be json, csv or json_lines (new-line separated JSON). /cubes (replacement for /model) returns a list of basic cubes info: name , label , description and category . It does not return full cube description with dimensions. Support for thee types of joins was added to the SQL backend: match (inner), master (left outer) and detail (right outer). The outer joins allows for example to use whole date dimension table and have “empty cells” for dates where there are no facts. When an right outer join (detail method) is present, then aggregate values are coalesced to zero (based on the function either the values or the result is coalesced). For example: AVG coalesces values: AVG(COALESCE(c, 0)), SUM coalesces result: COALESCE(SUM(c), 0). Module with statistical aggregate functions such as simple moving average or weighted moving average. The function are applied on the already computed aggregation results. Backends migh handle the function internally if they can. Window functions respect window_size property of aggregates. Both invert and split features are still provisional, their interface might change. cubes, dimensions, levels and hierarchies can no longer be dictionaries, they should be lists of dictionaries and the dictionaries should have a name property set. This was depreciated long ago. The models of cubes are now being created by the model providers. Model provider is an object that creates Cubes and Dimension instances from it’s source. Built-in model provider is cubes.StaticModelProvider which creates cubes objects from JSON files and dictionaries. Cubes from stores can be wrapped in a model namespace. By-default, the namespace is the same as the name of the store. The cubes are referenced as NAMESPACE.CUBE such as foreign.sales . For backward compatibility reasons and for simplicity there are two cube lookup methods: recursive and global . Cubes now distinguishes between measures and aggregates. measure represents a numerical fact property, aggregate represents aggregated value (applied aggregate function on a property, or provided natively by the backend). This new approach of aggregates makes development of backends and clients much easier. There is no need to construct and guess aggregate measures or splitting the names from the functions. Backends receive concrete objects with sufficient information to perform the aggregation (either by a function or fetch already computed value). New model objects: cubes.Attribute (for dimension or detail), cubes.Measure and cubes.MeasureAggregate. It can be named and labelled in any way. If cube has no aggregates, then new default aggregate named fact_count is created. Backends should now implement provide_aggregate() method instead of aggregate() – the later takes care of argument conversion and preparation. See Backends for more information. changed the exception hierarchy. Now has two branches: UserError and InternalError – the UserError can be returned to the client, the InternalError should remain privade on the server side. Rename [model] path to [models] main and remove all non-model references (such as locales). See configuration changes for an example and configuration documentation for more information. There are not many model changes, mostly measures and aggregates related. Make sure that dimensions, cubes, levels and hierarchies are not dictionaries but lists of dictionaries with name property. Create the explicit record_count aggregate, if you are using it. Note that you can name and label the aggregate as you like. In measures rename aggregations to aggregates or even better: create explicit, full aggregate definitions. See Aggregates for more information. The biggest change in the front-ends is the removal of the /model end-point without equivalend replacement. Use /cubes to get list of provided cubes. The cube definition contains whole dimension descriptions. Refer to the OLAP Server documentation for the new response structures. There were minor changes, mostly additions. if your model is too big, split it into multiple models and add them to the [models] section. Note that the dimensions can be shared between models. if you have muliple stores, create a separate stores.ini file where the section names are store names. Set the [workspace] stores to the stores.ini path if it is different than default. Review joins and set appropriate join method if desired, for example detail for a date dimension. Add cardinality metadata to dimension levels if appropriate.